Four years ago, four Mount Allison students came together to create the Mounties women’s curling team. Last season, the team won the AUS championship and ended fourth at the U Sports National Championship. Now, the five-woman team is looking forward to competing at this year’s AUS Championship in February. Sarah Doak, Julia Hunter, Samantha Crook, Molli Ward and Lauren Whiteway have each been curling for over eight years. Their coach Jim Nix has been coaching curling for 30 years and coached his first national-level team in 1994. This is his fourth year with the Mounties curling team. The team has yet to have an official practice, and last year did not formally practise at all. This is fairly typical of a university-level curling team, Nix said, because there are no set leagues like other sports have. All of the Mounties are playing on other teams within the Sackville Curling Club, where they have opportunity to practice their skills. The athletes said they have a lot of respect for their coach. “He is very knowledgeable and he will give us positive affirmations when we are doing well, but he can also be constructive when we aren’t,” said Doak, who added that Nix keeps the team calm during stressful games. “There is a little added pressure too, because U Sports is in Fredericton so it would be cool to play nationals in our home province, and we are all from New Brunswick,” said Doak, who has been playing with the Mounties since the team was created four years ago. Though not practicing together, the girls have been doing a lot of team bonding through their fundraising events. 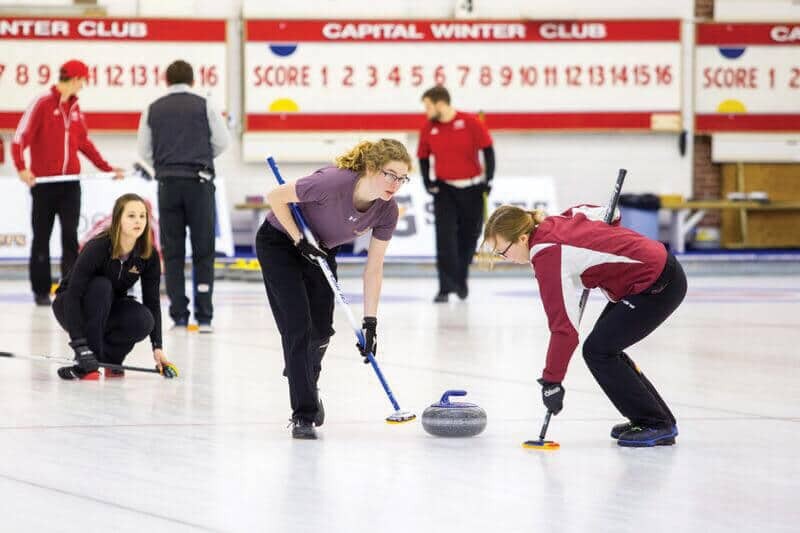 Despite playing in the AUS, the curling team is a club sport and does not receive funding through the university. “That has really been a challenge – that the girls have had to work hard to get to where they are and to get the sport to where it is,” Nix said. Last year, after the team qualified for nationals, Mt. A did contribute some funding to the team to assist in the expenses of flying to Alberta. This year, the team must fly to Newfoundland for the AUS championship and the funds to do so must be gathered through fundraising and personal contributions. Currently, the team is doing a fundraiser they call “Wine Survivor.” Entry is $10 and a bottle of wine. All the participants’ names will be entered into a draw and people will be eliminated when their name is drawn, unless they have purchased an immunity for $5. The final five names win. The last name left will win 50% of the wine. The draw will be held Dec. 5. See the Mount Allison Curling Facebook page for more details. The AUS Championship is in St. John’s from Feb. 7 to 10, and the U Sports Nationals Championship is in Fredericton from March 19 to 24. Emma MacMillan is a second-year student from Moncton, New Brunswick. She is studying psychology with a minor in French. She does synchronized figure skating and plays field hockey. Emma also enjoys hiking and spending time with her puppy.